An all-year-round location, suitable for sea and ski. La Rijana sits on top of a headland and looks out over the pool and sea. From the windows and terrace, you can watch sunrise and sunset and this is one of the very few locations in Almunecar well located enough to be able to do this. You can follow the fishing boats and may even be lucky enough to spot dolphins just off the coast. On a clear day, you can have views across to Africa. La Rijana is entered through a remote controlled gate and positioned just below an ancient Moorish tower, in a peaceful, residential, exclusive area of Almuñecar, known as Los Pinos, (The Pines). It consists of 14 houses, most of which are second homes and so it is generally extremely quiet. The communal pool (10x8m with Roman steps), which overlooks the sea, is open all year. The house is suitable for quiet couples and families but not for groups of party goers. All guests must agree to abide by house and residential community rules. It is a 2-storey house with 3 sea-view bedrooms, 1 king and 2 twin. The lounge-diner, furnished with leather sofas, has remote controlled TV, DVD and Hi-Fi (with jack socket for ipod - take your own lead). Unlimited Wifi is available and is bookable directly online during your stay, for your chosen period. The kitchen has granite work-surfaces, induction hob, combination –microwave oven, washer and large fridge-freezer. There is ample ceramic crockery and glassware for indoor use and plastic equivalent for terrace or pool-side. There are 2 bathrooms (1 en-suite) with shower, basin and bidet. The house is tiled throughout with rustic-style terracotta floor tiles. It is double-glazed, has window blinds, and is equipped with AC and heating. Patio doors open onto a terrace with wooden furniture. The terrace stretches over 2 sides of the house, giving superb sea and pool views. Hi, I'm Sheila, and with my husband, owner of La Rijana in Almunecar. We have 3 ‘children’, the eldest two work in finance in London and the youngest in Madrid. We first bought a villa in Spain about 15 years ago; we had lived in Peru and so spoke an amount of Spanish, and were looking for a holiday home in the sun, just a short flight from the UK, in a Spanish speaking area, where we could take our 3 young children. The southern coast of Spain was the obvious answer – it’s not called the ‘Costa del Sol’ for nothing! However we didn't want to be involved in the British invasion along the coast west of Malaga. We soon decided on a villa just outside the village of Canillas de Aceituno, 50 minutes east of Malaga. It was perfect: in a beautiful setting; with its own pool and far enough away from neighbours not to have to worry about the noise the children made as they played in the pool all day long. We could also ramble over the hillsides, through orange groves and vineyards, visit the local farm and trek to nearby streams for a dip. The traditional whitewashed village of Canillas, just 2 minutes away, was full of charm and character, and the people there very friendly. Not only that, but the coast was just half an hour away, so we could still go down to the sea, water park, horse riding, go-carting etc and had lots of shops, supermarkets and restaurants available should we need them. We called the villa ‘Bajo La Maroma’ (beneath Maroma) as it sits beneath Mount Maroma, the highest in that part of Spain. I’m happy to say, that we still own the villa and it too is available for holidaymakers when we and the family can’t use it. (See property 703736 on this site.) However, as the children grew into teenagers, we realised that they’d soon be wanting a busier environment: the buzz of the coast with shops, bars, music and restaurants beckoned. We looked around and found a new development of 14 houses in an amazing location overlooking the ocean, at Almunecar on the Costa Tropical, just an hour away. We found that the town was very Spanish and popular with locals from Granada and the surrounding areas. Again we were trying to experience the real Spain and not the British version of it. The house we chose had been designed by one of the architects and was perfect: amazingly, despite being just 2 minutes out of town, it was fabulously tranquil and had incredible mountain as well as sea views – we felt therefore that we had the best of both worlds. It was also exciting to be so close to Granada, the last city of the Moors, full of Moorish influence, and particularly well known for the Alhambra Palace. Not only that, but the ski slopes of the Sierra Nevada were easily reached, making it possible for Dad and the boys to go off skiing for the day leaving Mum and young daughter to relax and soak up the coastal sun. We feel really lucky to have had the opportunity to live, if only temporarily, in Andalucia and we invite you to share that experience by spending some time at either Bajo La Maroma, in the hills, or La Rijana, on the coast. Each bathroom contains sink, shower, loo and bidet. If the weather is bad for drying (or even if not), I highly recommend going to 'Speed Queen' launderette at Calle Colon Cristobal 2, where the lady in attendance (until about 2pm) is very helpful. pay as you go - 1 fee for multiple users. Instructions and password in the house, rates approximately €15/week, - rate reduces as period increases. open plan living / dining area with 2 leather sofas, glass-topped coffee table, TV and DVD, 2 boxes of DVDs, Hi-Fi (bring a lead for your mp3), CDs, fiction and non-fiction books, standard lamp. Modern and well equipped with fitted units, granite surfaces, large fridge-freezer, induction hob, combination microwave, washing machine; well supplied with kitchen and tableware for indoors and out. Spanish and English freeview (though sadly BBC and ITV have recently now been lost due to the relocation of a new satellite). We hope to regain access when new systems have been trialed. flamenco, jazz, easy listening, classical - an eclectic mix. 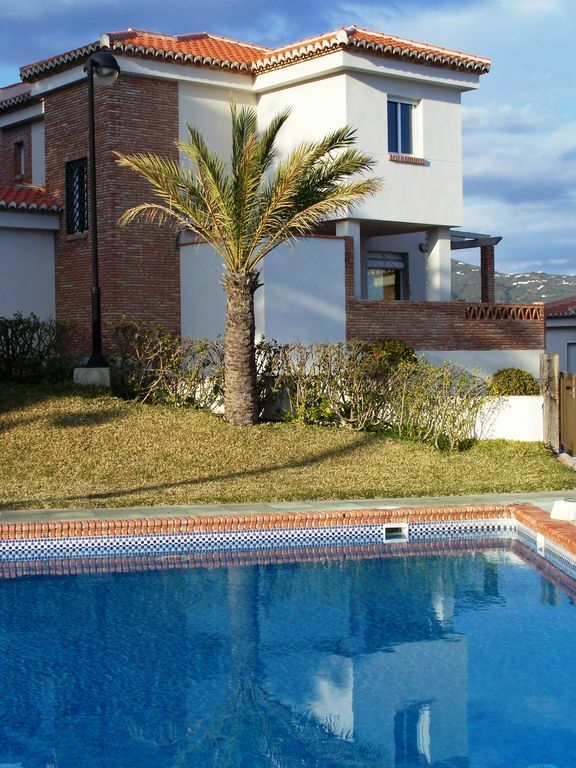 we are the only house with terraces on 2 sides, offering extensive sea and pool views. We have wooden table and chairs + occasional table, for 6; parasol and 2 sun-beds. Chairs for pool left for you. 10 x 8 m with 2 ladders and Roman steps, overlooking the sea. Read the reviews! Please note that any reviews I have entered from our guest book will not have star ratings as this is not something I can do - but rest assured, all the comments are from genuine guests! Spent 10 days in the villa and loved every minute of it. We would recommend a hire car from Malaga airport as the villa is only an hour or so away on an easy route but is located on a headland above the town so you need a car or a strong pair of legs to get back again when you venture in! The villa is in a small gated development that is relatively quiet, feels secure and has a parking space next to it. The communal pool wasn't busy even in the height of summer. It overlooks the town and beach and provides a perfect place to laze away the day with an occasional welcoming breeze. Sun loungers are available and the villa has parasols for when it gets hot. Watching the sun come up in the morning on the wrap-around balcony with a hot coffee and a book was bliss. If kids need to get out of the heat for a bit then the villa is well equipped with a DVD player and TV to keep them amused while they recover. The kitchen has enough crockery and utensils and a large fridge/freezer which was perfect for stocking up on essentials for the holiday. It keeps the wine and beer cold too! Bedrooms are big enough and the beds are comfy. I'm normally a very picky sleeper and don't look forward to staying anywhere different but slept like a log for the whole 10 days. Almunecar is a nice Spanish town with a great old quarter full of small winding which lead down to the sea. It has big supermarkets (Lidl and Mercadona) and plenty of small tourist shops to browse in and bars and restaurants to eat out in. The food and wine is good quality and cheap if you choose from the menu of the day (Menu del dia). Try and get to La Jijonenca if you love ice cream as it is a small family run shop with a huge selection of flavours. A large market is in town centre once a week and you can easily spend an hour browsing. We didn't see many English tourists and managed to easily get by with very little Spanish; everyone was very friendly and helpful. The town has a water park close to the villa which is a fun way to spend a day, particularly if you like speed then try the big slide!. Almunecar is also a good place for those keen to explore as it is close to Nerja (stalagmite caves), Frigiliana (very pretty mountain village with arty shops) and Granada (Alhambra palace). Check out the time of year that you visit as there are lots of festivals going on which are always great spectacles. Couldn't recommend this villa more. Have been several times before and look forward to returning again. Thanks for your lovely and very comprehensive review. I look forward to having you and your family back next year! Had a lovely weekend in this villa on top of a hill. Amazing views and chilled vibes. Great house for families and friends looking for a relaxed holiday. Thank you Sheila, i’ll def come again! I'm glad that you enjoyed your short trip! My husband and I love staying here, it’s now our fourth visit. The house is in a great location near to the beach and the town, but it’s still quiet enough as it’s on a hill, with amazing views overlooking the beach. The house was clean and the kitchen was well equipped. We relaxed on the large wrap around balcony and enjoyed our meals out there. The pool was always clean and we went each day. Sheila was very helpful answering any questions we had. We shall definitely be returning for a fifth visit and have recommended it to our family and friends. It was lovely to have you again as return guests and thanks for your fabulous review. I'm glad that once again, the house and the location met all your expectations. We look forward to welcoming you for a fifth time and your friends and family will be most welcome. great villa equiped with all you need plus more!!!!!! It was great meeting you, and thank-you for being such thoughtful guests - we'll always welcome you back. Fantastic villa, can't wait to return! Just returned from a two week stay in La Rijana, and I can say we will definitely be back. What a beautiful house, very spacious and spotlessly clean, we had everything we could have wished for. The views all around the house were breathtaking and we spent many evenings sat out on the terrace surrounded be the sea. The pool was kept lovely and clean and was just a few steps away, the kids spent hours in there on the very hot days that we had, and they mostly had it to themselves. It was very quiet while we were there, even though it was August. A lovely walk down the hill to the Spanish town where we had some wonderful evenings wining and dining. Yes it is steep back up the hill, so we made use of the local taxis at only 7 euro a time and enjoyed trying to speak Spanish with them! We did have a small problem on arrival as the previous guests had not left the key fob as instructed, but after contacting Sheila, this was sorted without issue within 30 mins. Thank you For a wonderful stay. Thank you Stephanie for your wonderful review; very generous of you! We're glad that you had such a great time and took advantage of the lovely location of the house and the town itself. We look forward to welcoming you back next time. Excellent property in an ideal location. Thank you for a wonderful holiday. The property is private, very well maintained and perfectly equipped. We (a family of four including two teenagers) enjoyed exploring and snorkelling at the many beaches and coves along the Costa Tropical before returning to relax on the balcony or swim in the pool. Granada is less than one hour away - we had a fantastic walk near the Alhambra looking across to the snow-topped mountains of the Sierra Nevada and overlooking the Palace gardens. We would love to return again one day as we were desperate to spot the dolphins. Thanks again. I'm so pleased that you all enjoyed it. Well done to the teenagers for snorkelling - I really enjoy that too, but usually after the sea's had a chance to warm a bit more, in October! Snow, sea and sun - sounds good to me! Many thanks for choosing us and we'd be delighted to see you again with a small returners' discount. Almuñecar has the heart of an old Andalucian pueblo with hilly, narrow, pedestrian streets full of bars, restaurants and shops. The international jazz festival 'Jazz en La Costa' in July is fabulous and its beautiful venue in the Botanical Gardens beneath the castle makes it all the more special. If you like markets, the town food produce market is on daily until about 2 pm, Friday morning is the weekly market in the big area in front of Lidl and at the same spot on Sundays, is the flea market. Out of town you can travel up Almuñecar’s tropical valley, or go to the hot springs at Alhama de Granada and take a swim in Lake Bermejales. If you want a large modern shopping mall, then go to El Ingenio, in Velez Malaga with hypermarket, department store, individual shops, snack bars and restaurants and a multi-screen cinema. Finally, remember the awe-inspiring caves at Nerja and the Alhambra Palace in Granada are close at hand and the Sierra Nevada skiing and Alpujarras mountains await you both in winter and summer. This property is only suitable for responsible couples or family groups. 'Party people' are not accepted. The owner must be made aware of anticipated arrival and departure times in order that the house can be properly prepared for all guests. Arrival is after 16.00 hrs and departure by 10.00 hrs unless by arrangement with the owner. Keys will generally be collected from, and returned to the on-site manager. In accordance with the local laws, I require passport details of all guests over 16 years old and also the postal address of the lead guest. All rates allow for moderate but not excessive use of electricity. Excess use will be charged from the damage/loss deposit. Pets may be considered under certain circumstances. Travel cot available. fee charged. Long lets on application. Acceptance of a booking offer means that the client will abide by house and community rules and accept the terms of booking.